Beautiful location among rolling hills and gum trees. Relax and enjoy. We invite you to share our 13 acres of Australian bush paradise. Wake up to bird song or relax on your private deck to enjoy a coffee. At times you may be fortunate to see the semi-resident koalas and kangaroos especially if you take our Scrubby Gully walk. Part of Scrubby Gully walk is along a dry-stone wall that follows the creek to the dam. Built in the early 1900's, wagons used it to transport vegetables to market from the market garden in the valley. 'Bimbimbie Hideaway' consists of two distinct two buildings, the Studio and the Mudbrick Cabin which are located adjacent to each other. Access between the two buildings is provided by 5 steps from the Mudbrick Cabin deck to the private patio of the Studio. The Studio completed in 2014 has all mod cons. It contains a comfortable queen-size bed, a modern en-suite, tea/coffee making facilities, small fridge, air conditioning, and TV. 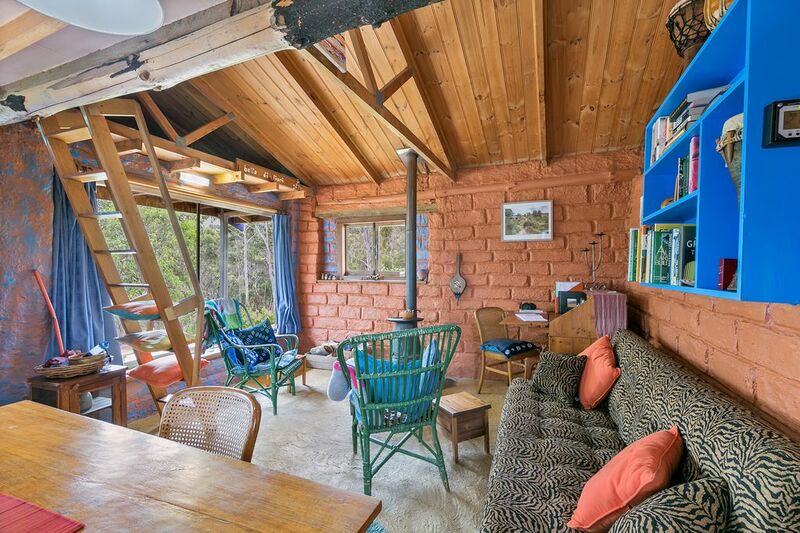 The Mud Brick Cabin was built by the present owners in the 1980’s who used local and recycled materials. This area is off-grid and as such is only powered by a solar panel which runs three lights. There is no capacity to plug in electrical equipment in this area. This area is warmed in winter by a pot belly stove. The spacious kitchen area in the Mudbrick Cabin is well equipped with a gas cook top and extensive cooking equipment. However, the fridge is located in the Studio behind the first sliding door. Please ask us, if you require more fridge space, as we can provide additional cooling options. A BBQ on the deck complements the cooking facilities. Bimbimbie provides an unique experience for people to relax and unwind and wanting a short break from their busy lives. Perfect for couples seeking a unique and relaxing experience. You will have direct access to the Mudbrick Cabin and the Studio. Park your car on the left hand side of the road, near the wooden pole lying on the ground. Then walk down to our house. Louise will then open up the accommodation and discuss any queries you may have. If Louise is not available the keys will be left in the key lock. This is attached to the back of the post next to the gate with Bimbimbie sign. Enter the code to collect the keys. The main house is about 100 metres away and your privacy will be respected. We encourage to you to walk around proteas and garden as well as take a walk down the hill to Scrubby Gully Creek. We try to greet all guests on arrival and provide a short introduction to the unique aspects of the accommodation. There is a lock box that hold the keys that you can access if you are planning to arrive later in the evening or we have gone out. The code to the key box will be provided if either of these situations arise. Having your own transport is a necessity as the local public transport is over 5kms away. 'Bimbimbie Hideaway' is located down a shared private road. This 1 km dirt road needs to be taken slowly due to drainage bumps. Kangaroos also have a habit of crossing the road expectantly especially during dawn and dusk. Please drive very slowly past the first house. Often dogs and small children are on the road. The ability to negotiate uneven ground and steps with no railings is a necessity. This also makes the space not safe for children.